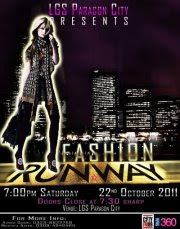 LGS Paragon presents its 2nd annual fashion show, "THE FASHION RUNWAY". This year, It's all about going crazy. All of the categories require the participants and designer to exhibit their creativity and their ability to think out of the box. Be original, be creative, and go gaga! *The Last Date For Registration Is 10th of october. *Private teams are allowed and the procedure is the same. Candyland: Bring out your inner child and express your childhoodfantasies as colorfully as you can. This is a chance for you to portray just how colorful your imagination can be. The sky's the limit! Extraterrestrial: What would you be if you weren't from earth? Aliens and beings from outer space are never quite depicted to the satisfaction of our imagination. Express how you imagine people from other planets would and should look like. Macabre: Take inspiration from the Grim Reaper and Harry Potter's legendary Dementors. Your designs and demeanour should reflect death, doom and devastation. As the title suggests, be as grim and macabre as you can. The portfolio will consist of pictures and sketches of the outfits that the teams wish to design. The portfolio may consist of reference images to show where the designer is getting his inspiration from (if he has any). A portfolio will give a basic idea of what got the designer started! Any team that does not submit a portfolio will not be allowed to participate in the fashion show. The portfolio should give the entire idea of what the designer is working on. • There will be a maximum of 2 teams from each institute. They will consist of 1 designers and 3 models. • Teams will have to bring their own music. • They will choreograph their own models. Vulgarity of any sort will not be tolerated and the team will be disqualified immediately. The decision of the judges would be final and cannot be challenged.